One of the best things about Christmas is gift hampers. Whether you buy them for yourself or send them to someone, they are literally Christmas in a basket! Although hampers aren’t limited to Christmas, a basket full of chocolates and booze or chutneys and teas are fully appreciated when shared with your family in the days between Christmas and NYE. The idea of sharing mulled wine by the fire with your family, gorging on cheese (I love cheese) and yummy chutneys is magical. This maybe because in my family this time of year means, family, food, parties and good drinks. 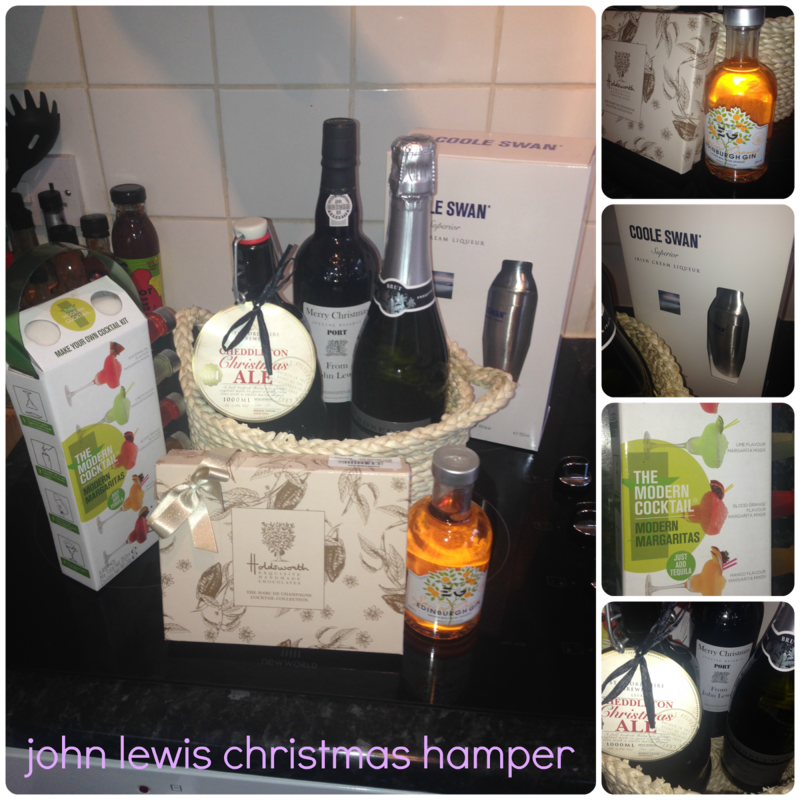 I received this gift hamper* from John Lewis, which was a lovely. Unfortunately, before I could show it to Hubs, the box of chocolates had magically emptied down my throat…. Everything in the hamper has come in so usefully in the run up to Christmas. I used the Irish Cream Liqueur to make Irish Coffee. Hubs, his brother and I were demolishing a cheese board, and decided to be civilised and drink port with it – I’d never tried port before, but the Christmas Port was delicious with our cheeses – definitely my favourite part of the hamper! As for the Edinburgh Gin, I love a good G&T, but was not completely sure how to use the Spiced Orange Gin. I discovered it is quite a lovely touch to a hot cider or in a Spiced Orange and Ginger Cocktail. Hubs and his friends will be testing the ale at our NYE soiree, where we will also be testing the Margarita! What would you want in a Christmas Hamper?